This silly round-up of cute Monster Party Ideas proves that Colorful, google-eyed monsters are perfect party pals! Halloween parties don’t have to be dark and gruesome. In this round-up you’ll find dessert tables, entire party set-ups, decorations (monster balloons and paper bags, for example), craft suggestions and even favors like monster bubbles and monster munchies. Kids’ themed party food possibilities include monster eye cookies, monster oranges, cupcakes and cake, monster claws, eye-of-newt pretzels, monster Jello and Monster University treats. Don’t miss out on these Unique Ways to Hand Out Halloween Treats that are perfect for class gifts and parties! Get crafty this Halloween with 14 Halloween Kids Crafts Made from Toilet Paper Rolls. Behind the door, under the bed, beneath the table — everywhere you look there are silly monsters just waiting to party! There are endless ways to approach a monster party! We’ve scared up 34 different takes on a monster birthday party theme, so you can choose from the best. From a Where the Wild Things Are spin to a Monsters University inspired event to a tickle monster bash or a monster mash, you can get loads of party ideas from these examples! Check out the birthday cakes, dessert tables, party decorations, party favors, party games and activities and more. There is budget-friendly, and then there is this amazing boy bash monster birthday party tablescape done on a very tight $20 budget! Just wait until you see the eyeball chandelier and monster chairs! Cupcakes, popcorn, and mini monsters were some of the food that was served. This party is proof that an incredible birthday party doesn’t have to be expensive! This monster themed boy’s birthday party is more cute and silly than scary. 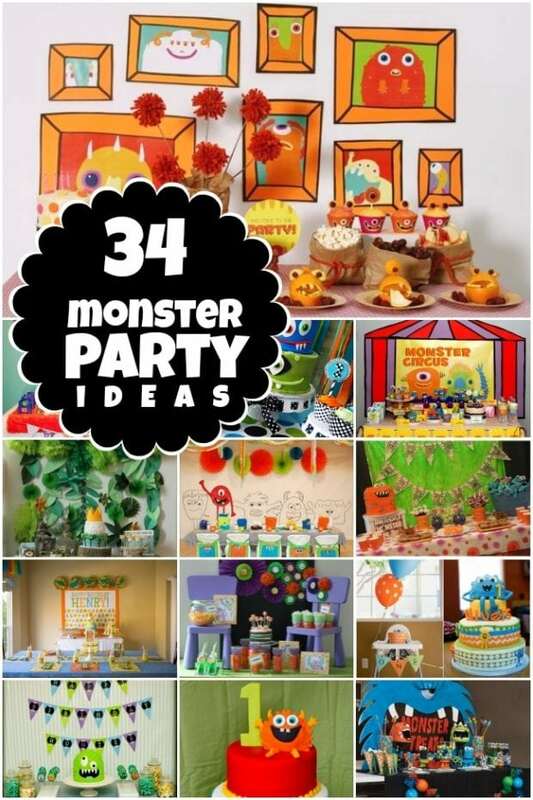 It features playful monster printables that dress up everything from the dessert table backdrop, to cupcakes, beverages, straws, cutlery and more! There is even a printable monster crown, which makes for a cute party decoration as part of the place settings, and a great take-home party favor. The monster cake and cupcakes are especially awesome in this monster party! Vibrant shades of orange, green, blue, and yellow combine in this silly monster first birthday party, awakening the senses through colorful balloons and decorations, cake, cupcakes and party favors. The cakes look like adorable little monsters. Cupcakes are costumed in printable custom cupcake toppers. Cake pops featuring edible eyes were displayed for all to see. Come one! Come all. This monster circus dessert table will leave you inspired to create your own monster celebration. The clever desserts resemble circus acts. Notice the barbells made from cake balls, the marshmallow pop monsters on stilts, the ringmaster cupcake, and even a cake with a “highwire act” topper. The monster fest printable collection set the colorful, vibrant and playful tone of this dessert table. It’s entirely possible to throw a not-so-scary monster birthday party! Focus on bright, happy colors and friendly looking monsters. Incorporate adorable table settings, including monster plates, monster napkin rings, monster beverage wraps, party straws and fun placemats! 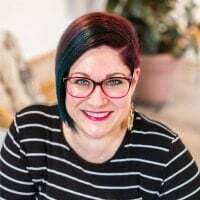 There are countless ways to bring in the cute monster feel using fabrics, printable tags and labels, and creative monster birthday party food. Just look at the amazing candy-coated pretzel sticks displayed in a googley eye embellished jar as an example of how to reinforce the monster theme. My personal favorite detail is the adopt-a-monster party favor station. Those monsters are so stinking cute! How do you create a colorful monster party? You begin by using bright colors in your decorations, favors and even your food. Then you set adorable monster favor bags that are scary cute filled with brightly colored candy and treats. Don’t forget monster party snacks such as big-eyed monster cupcakes. Be sure to prep fun monster party activities such as fun monster coloring pages with crayons. Monsters slurp, munch, and chomp while they eat; that’s for sure. This monster birthday party dessert table is full of colorful monster eats that will help your party guests do the same! From monster pops to monster munch, green Jell-O, and other items to gobble, you’ll love the printable decorations that help tie together everything from the monster cake to the monster drinks. Your little monsters will love turning plastic Easter eggs into cute monsters. The transformation is so simple using craft paint, feathers, googly eyes, hot glue, rick rack, pipe cleaners, and other random craft supplies. Fill the finished monster eggs with some candies for a great monster party favor. If you’re a sucker for a great Halloween party craft DIY, this tutorial for making your own lollipop tree is awesome! This lollipop tree is inspired by monsters and includes Dum Dum suckers decked out in creepy eyeballs and monster antennae created from chenille stems. The core of this project is designed using a terra cotta pot and Styrofoam ball. Here’s a monster party craft that kids will really enjoy! The best part? You can pull out a variety of leftover craft supplies and let kids use their creativity to design their own paper bag monsters. One craft essential you’ll definitely want is an abundance of googley eyes. Kids will enjoy playing with their monster creations as much as making them! Gooey monster eye cookies that stare back at you certainly add some fright to a monster party dessert table! These cookies use a cake mix as the foundation and are simple to make, but do require some chilling time in the dough stage. While the example features green monster cookies, you could use a variety of food coloring options to make a diverse group of monsters. Kids at your monster party will go crazy over these eye of newt pretzels! They are so easy to make using this step-by-step tutorial. Their bright candy melt coating, sprinkles, and candy eyes make them more cute than scary! They are the perfect addition to a Halloween or monster party. Serve up a healthy snack at your next monster party! These monster oranges are simple and fun to make! With the right supervision, making them could even be a great monster party activity! For the monster oranges, you’ll be cutting a wedge out of each orange, using the cut out pieces to create monster teeth and hair. It’s always nice to have a healthy option for the party dessert table. If you want to bring a little creepiness to your Halloween baking this year, pay close attention to the tips for making these monster claw cupcakes. You’ll need to bake (or buy) some chocolate cupcakes, and whip up a batch of your favorite vanilla buttercream. The claws are made out of marshmallow fondant, but store bought fondant works great too! The bottom of a spoon handle makes great claw marks, especially when “bloodied” red frosting is painted on the claw marks for added effect. Cupcakes are not just a favorite party food; they are also a fun party activity! Ramp up excitement at your next monster party by letting kids decorate their own monster cupcakes! You will want to have baked cupcakes, frosting, food coloring, a variety of sanding sugars, marshmallows, and a black, edible food marker on hand. Get ready to be amazed by all of the fun edible monster creations party guests design! All eyes at your next Halloween or monster themed party will be on this cake! You can create your own monster eye cake with some cookies and candy, and of course, your favorite layer cake! Junior Mints, M&Ms, and Oreos are the main ingredients needed to make the spooky eyes! Don’t throw out those Starbucks Frappuccino bottles just yet! You can upcycle them to create these adorable Halloween monster munchies jars! You’ll need to thoroughly sterilize the jars and remove the label before costuming the bottles in printable monster labels and filling them with colored candies. The printables are free and make creating a fun Halloween monster treat or party favor so easy. Celebrate everyone’s favorite monster with some Monsters University inspired treats! Mike Wazowski is easy to recreate in Rice Krispies form! You’ll need the standard margarine, marshmallows, and rice cereal, plus a few extra ingredients—green food coloring, candy eyes, and white jelly beans. Follow this simple tutorial, and you’ll have plenty of Mike Rice Krispies treats to serve up a crowd at your monster party! Budget-friendly and easy to make, these Jell-O jar monsters make a creative addition to a monster party dessert table! Guests can even help create the monster faces! To get started, you’ll need small Mason jars, orange Jell-O, candy eyes, and an assortment of gummy candies for creating your monster’s hair and face. Who says you can’t play with your food? Turn this into an edible activity station at your next party! Looking for a sure-fire way to bring smiles to your monster party guests’ faces? Treat them to these adorable monster sandwiches. Kids will love finding these awesome edible creatures included with their lunch! You’ll need bread, cheese, lunch meat, olives, mustard, toothpicks, and a round cookie cutter. Follow the five simple steps to serving up plenty of giggles and smiles! Change ordinary, boring old cupcakes into marvelous monster cupcakes! The transformation is easy with the help of printable monster birthday party cupcake wrappers! These bright wrappers include digitally designed monster facial features. Add a few candy details, and you’ll delight guests at your monster birthday party! Give ordinary balloons a monster party makeover! Use a variety of lightweight craft materials such as paper to create and glue on facial features like eyes, teeth, and antennae. Permanent markers can be used to add details, like lines for lips, too. 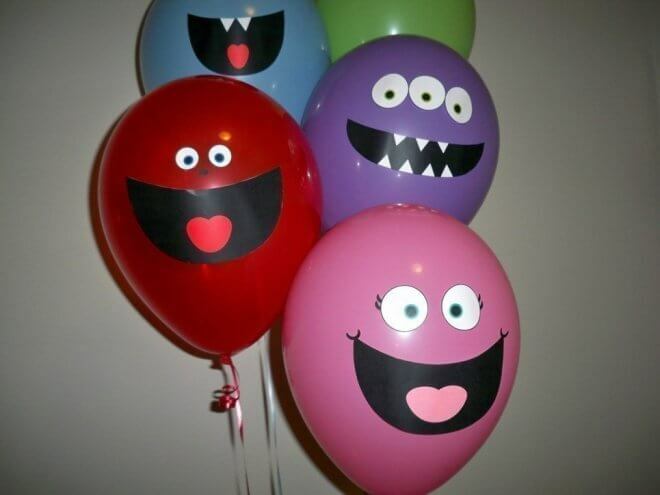 Use the balloons to add some oomph to your monster party decorations. Every great party starts with an amazing invitation! Scare up some fun for your monster party by sending out these adorable monster fest invitations! With the printable file downloaded to your computer, you can print out the invitations on a sturdy cardstock right from home! Fun party games like “Pin the Eye on the Monster” and “Don’t Scare the Monster” kept guests entertained at this monster party. Full of simple, affordable DIY decorations and party favor ideas, you’ll want to see how one mom used thrift store finds and her children’s imaginations to create a darling party centered on monsters! Even the cake was a monster with orange coconut fur! And the adopt-a-monster favor station was definitely a genius idea! Each monster was handmade and unique! Get geared up for your monster party by providing them with their own monster birthday party hats! They can sport these monster party hats during the celebration and keep them as a party favor! Simply download the printable file, print on sturdy paper, and cut out! Plan your own Not so Scary Halloween Party with these party supplies gathered by the crew at Spaceships and Laser Beams.